What's the Difference Between Position Control Hinge and Panel Locks? When you need to keep your room divider set up for long-term use, such as classroom for an entire semester, as an office cubicle, conference or storage room, optional Panel locks provide the answer. Roll the room divider into place, open the panels and arrange in the desired shape or angel. Once in position, a simple twist of the rubber coated knob at the top of the hinge keeps the panel locked in place. 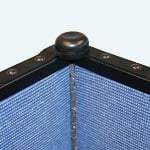 Our position control hinges are standard on all Screenflex Room Dividers. The position control is mounted at the apex of each hinge. The position control hinge is a spring-loaded device that makes a clicking sound as it opens to secure the panels in place. Click to see a short video which explains the function and differences of Screenflex’s Position Control Hinges and their optional Panel Locks.